Rugby league is a hard enough game to play with two hands, but Dylan Walker's effort to play most of Sunday afternoon's game one-handed and score two tries was one of the braver things we've seen so far this season. Walker's left hand was a virtual passenger for 60 minutes of Rabbitohs' clash with the Wests Tigers. He barely used it to catch the ball and refused to use it to fend or shield himself from collisions. He was clearly in pain and every time he was tackled, he struggled to his feet, carrying his arm. It was a gutsy effort, but something he had done before. "He's learnt that and he's grown in himself to be able to do those sorts of things for the team which is a great sign for a young kid," Rabbitohs coach Michael Maguire said. "He's had a bit of practice there. He did that last year when we played against the Warriors over in Perth." Scans on Monday revealed Walker had broken his hand and will be out for three to four weeks. "I didn't want to come off, I didn't want to let the team down," Walker said after the win. "I just tried to do my bit, tried to do the best I can. I'm really thankful for the boys. They really backed me up and really helped me through the game." Hands up if you had Newcastle in your top eight this year? Only six teams since 1998 have started 3-0 and missed the finals. We're not ready to lock them in for a finals berth just yet, but they are showing remarkable commitment and passion to start 2015. The Knights are the new comeback kings after coming from behind in every game so far this season. They trailed Warriors 14-6 with less than 15 minutes to go, they fell behind to the Cowboys 14-0 in Townsville and on Monday night, they were behind with only five minutes on the clock on the Gold Coast. Each time, the Knights have found a way to win. Coach Rick Stone has the Knights playing for each other and they are playing a tough brand of football which should be well received in the Hunter. You would think it's the first thing you'd learn in juniors. Don't let the ball bounce – that crazy oval shaped thing has a mind of its own. Already this season we have seen several cases of kicks being allowed to bounce, a tactic that can backfire badly for the defensive team. 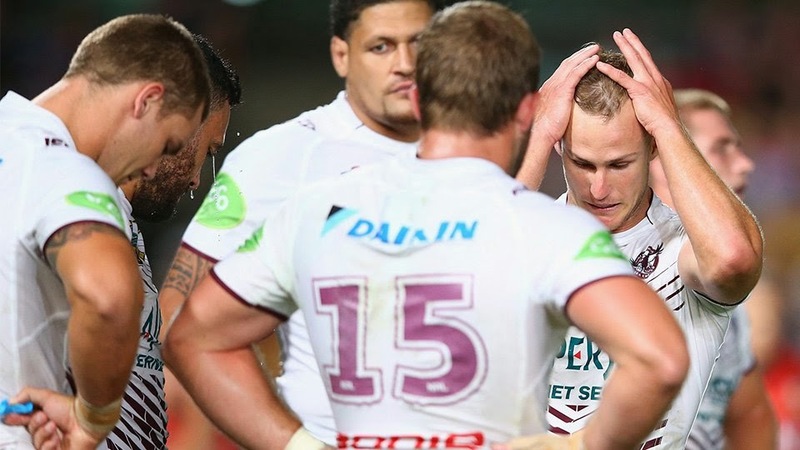 It caused havoc at Brookvale Oval where on three occasions the Sea Eagles and Bulldogs regained their own kicks because the receiving team allowed the ball to bounce. Both teams conceded tries directly off the back of one of those blunders: Sam Perrett scored when Brett Stewart and Steve Matai let the ball bounce between them, while Manly were let back into the game when the Bulldogs failed to catch a kick-off. It was almost a carbon copy on Sunday when Gold Coast five-eighth put up and chased his own midfield bomb, which was inexplicably allowed to bounce by Newcastle. It bounced alright, right back into the grateful arms of Sezer who scored beside the posts. In Round 2 it was Rabbitohs winger Joel Reddy letting the ball bounce and momentum of the game changed in an instant as Michael Jennings was gifted the easiest of tries. If they didn't know the lesson already, NRL wingers and fullbacks should have the message rammed home again at training this week. Who is the game's best prop? Bulldogs skipper James Graham and Cowboys veteran Matt Scott have some stiff competition from the young guns these days. Aaron Woods and George Burgess are two of the best young props in the game, and they're only getting better. Both crunched through the numbers at ANZ Stadium at the weekend. Woods ran for 223 metres and made five tackle busts, two offloads and 33 tackles. Burgess wasn't far behind with 185 metres, two tackle busts and 33 tackles. We'll give Woods the slight points-decision this time around. Well done to Trent Sutton and the team at the NRL for bringing Play NRL Round to life. It is great to see the game focussing on grass roots and encouraging people from all ages to get involved in the game. This week we've heard some amazing stories from players and volunteers about how they got involved in rugby league and the great things they have done. Truly some inspirational people. It is not too late to get involved.